What is the Polk Command Bar? The Polk Command Bar is a 2.1-channel soundbar with a main unit and a separate wireless active subwoofer. There's support for Dolby Digital and DTS, along with two HDMI inputs, an HDMI output with ARC, Bluetooth and Wi-Fi. There's even a full-size controller for effective day-to-day operation, and Polk Audio's own remote app for easier wireless setup. If that wasn't enough there's Amazon Alexa built in, allowing you to control the soundbar with your voice and providing a fully-functioning smart assistant. The Polk Command Bar certainly looks the part, with a sleek main unit that is wide enough for larger TVs but using a form factor so low that it doesn't block the screen. The build quality is good for the price point, with a largely plastic construction that uses a matte black finish and a black fabric covering. 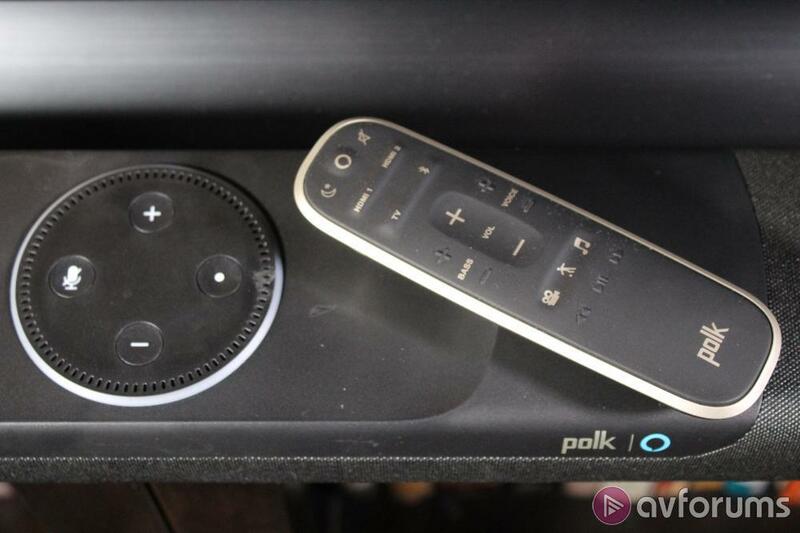 The design is dominated by the an illuminated circular section with four controls that makes it look like Polk has literally built an Echo Dot into the soundbar. Just like that device, there are basic controls and a ring of light that illuminates when interacting with Alexa. The Command Bar uses forward-firing speakers in a stereo configuration, with acoustically tuned vents at either end. The connections are located in a recessed area at the rear and, at the back, you'll also find two screw holes for wall mounting the soundbar if you prefer. The included wireless subwoofer is made of matching black plastic and uses a ported downward-firing 6.5-inch driver. The subwoofer measures 188 x 367 x 368mm (WxHxD) and weighs 3.92kg, while the main unit measures 1091 x 51 x 102mm (WxHxD) and weighs 2.25kg. The Polk Command Bar has two HDMI inputs and an HDMI output with ARC (Audio Return Channel). All these connections are HDMI 2.0b with support for 4K/60p, wide colour gamut (Rec.2020), and high dynamic range (HDR10 and Dolby Vision). In terms of other connections, there's an optical digital input and a USB port for powering streaming devices. As far as wireless connections go, there's support for Bluetooth and Wi-Fi. In terms of control, you can obviously use your voice, thanks to Alexa, but there are other options. The central circular section also includes physical controls for volume up and down, mute, and action. Polk also include a full-sized, remote control that's black with a silver trim and has a rubber finish. It's comfortable to hold and easy to use with one hand. The remote control includes all the buttons you need to control the soundbar such as power, volume, and mute, along with separate ones for each of the sources. There are also controls for setting the subwoofer level, centre channel level, play/pause/skip in Bluetooth, and four different EQ modes (Movie, Music, Sport, and Night). There's even a button for activating Alexa, which can be useful when the volume is high and it can't hear you properly. 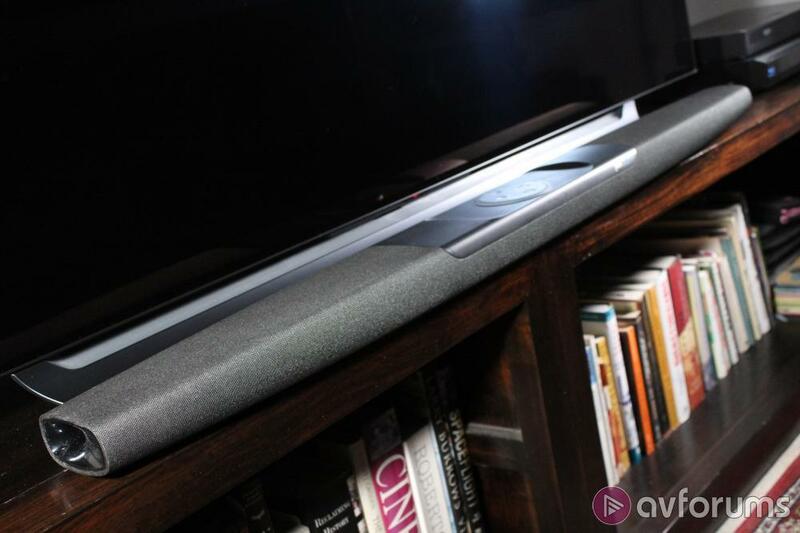 The Polk Command Bar is unusually well specified for a soundbar that costs just £249. For a start, the main unit has two-channel speakers built in, with each composed of a 1-inch tweeter and an oval midrange woofer that measures 1.25 inches high and 3.25 inches wide. There's 80W of Class D amplification for each channel as well, so the soundbar has got a kick. It's unusual to get an active wireless subwoofer at this price point, but Polk hasn't skimped here either with a ported unit that has a downward-firing 6.5-inch driver and 100W of Class D amplification. The driver array in the soundbar and the sub itself have both been tuned to deliver an integrated performance, and there's support for the Dolby Digital and DTS audio formats. Another unusual feature in such a relatively inexpensive soundbar is the inclusion of two HDMI inputs, as well as a full-sized remote control. Once you include built-in Bluetooth and Wi-Fi, you start to realise that the Command Bar is an attractive proposition. There's a Polk app for easier set up, and the company even throws in an HDMI cable and an optical lead for good measure. All this is before I've even mentioned the Command Bar's headline feature, the built-in Alexa smart assistant. This is very different from devices that simply work with Alexa and, instead, the Command Bar actually has built-in far-field microphones and a full Alexa voice service. This allows you to control the soundbar and ask Alexa questions, just as you would with any other Alexa speaker. 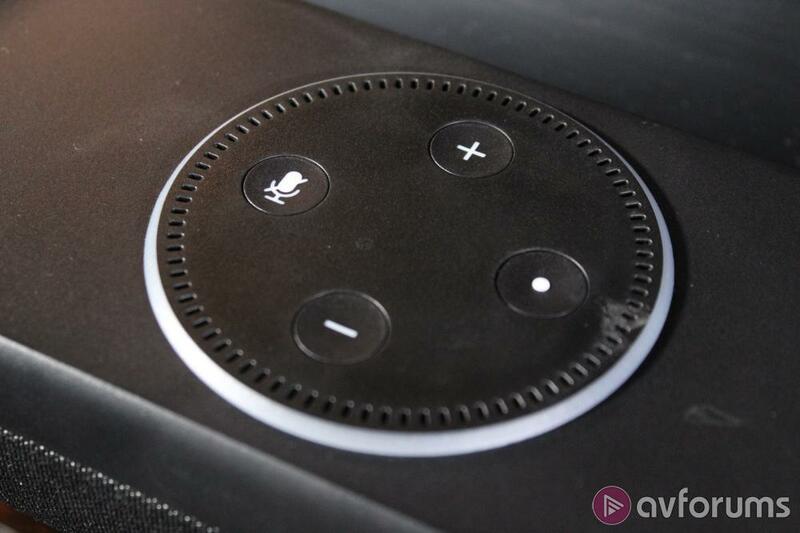 The Command Bar also supports Amazon's Multi-Room Music platform, which allows you to play and control music across multiple Amazon devices, and ask Alexa to stream your favourite songs. Finally, the Command Bar includes Polk's proprietary Voice Adjust technology that allows for clearer dialogue in today's complex multichannel soundtracks. The Polk Command Bar is a piece of cake to set-up, and all you really need to decide is whether to stand or wall mount the main unit, and where to position the subwoofer. The soundbar and sub should pair automatically (there are lights on the back of both units to indicate pairing), although if they aren't there's a manual sync button on the rear of the sub. The latter might also require some careful placement and judicious use of the bass adjustment control to get the overall soundstage balanced. 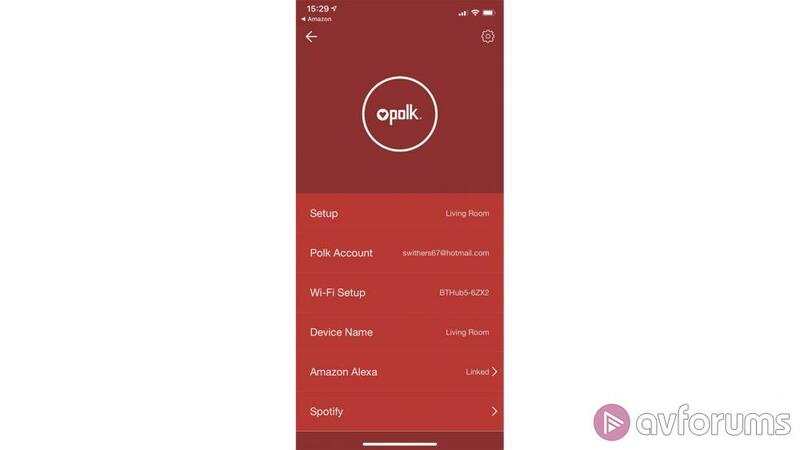 Thanks to Polk's handy app, it should only take a couple of minutes to connect the soundbar to your local network and get Alexa up and running (just follow the instructions). If necessary, you can also update the firmware using the app. The display on the Command Bar is composed of a single LED that changes colour to denote the type of content, source and mode selection. Frankly, it's impossible to remember all the different colour combinations, but since the soundbar talks to you, it's largely redundant. You can control the Command Bar using your voice or the provided remote, but if those aren't enough there's also the option of using your TV remote. If you're using the HDMI connection and your TV supports CEC then you can also use your TV remote to perform certain commands on the soundbar. If your TV doesn't support CEC or is connected via the optical input, then your TV might use some of the preloaded IR codes. However, even if it doesn't, there's still the IR learning function. 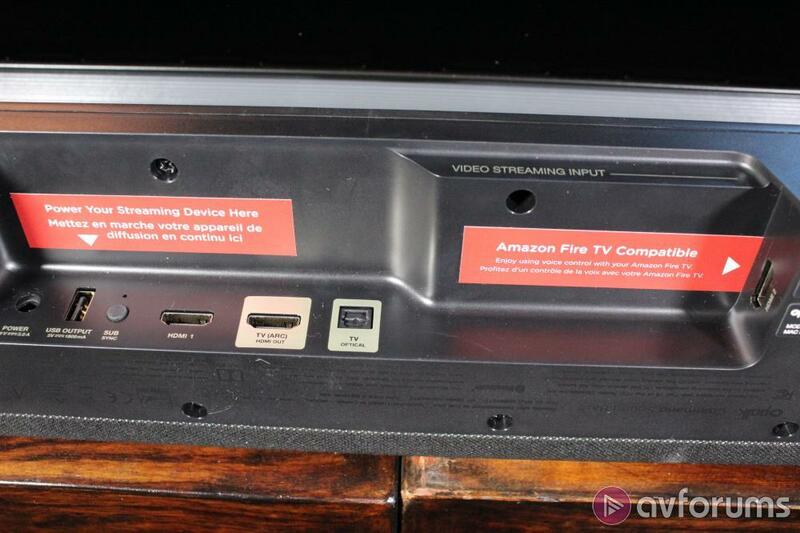 Then all you need to do is decide which devices to connect directly to the soundbar, and which to connect to the TV before sending audio back via ARC (if that's an option). For testing, I connected my LG 65C8 OLED TV via HDMI-ARC to the Command Bar, and then I connected an LG UP970 UHD Blu-ray player and a Sony PS4 Pro directly to the soundbar itself. I also connected Amazon Alexa to my Wi-Fi network for streaming, and evaluated the Bluetooth connection using my Apple iPhone X. The Polk Command Bar is a fantastic performer for the money, with a wide front soundstage thanks to the size of the main unit and the use of effective tweeters and woofers. The width of the soundbar means there's a decent amount of stereo separation, and it's a good match for TVs with screen sizes up to 65 inches. The Polk is capable of an excellent mid-range and also has a well-defined higher-end, allowing for better rendering of music and effects. Despite the lack of a centre speaker, dialogue retained clarity and was anchored on the screen. However, if you do feel that dialogue is difficult to understand, you can use Polk's proprietary VoiceAdjust technology to improve intelligibility by moving the Voice control on the remote up or down. The inclusion of acoustically-tuned vents at either end help in the creation of a sense of width, which allows the Command Bar to deliver music and effects on either side of the screen. The soundbar also has a decent amount of amplification (160W), enabling it to fill a normal size living room. It also means you can turn the volume up quite high without the main unit running out of steam or distorting. As a result, the Polk can immediately upgrade the audio performance of your TV, and that's before you even consider the extra bass from the subwoofer. The inclusion of a wireless active subwoofer is unusual at this price point, but means the soundbar can deliver deeper bass. 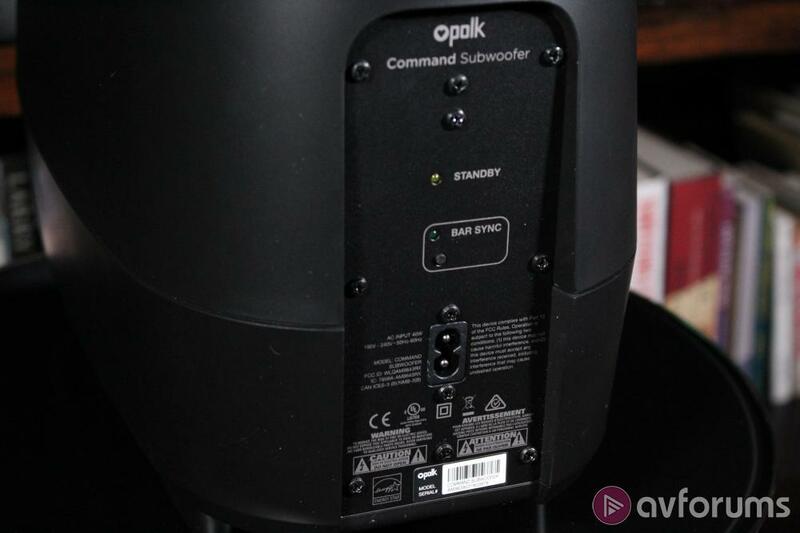 The included subwoofer, while not massive, is certainly able to produce a solid bass performance and is tuned to integrate effectively with the soundbar. There's also a Bass control on the remote for adjusting the subwoofer level to help blend it with the soundbar. The combination of the 'bar and sub can create a big soundstage that spreads across the front and digs deep at the low end. There's 100W of amplification in the sub, and when combined with the soundbar the result is a balanced system that can sound natural and detailed, but add impact when necessary. The Command Bar sounds great with regular TV programmes, and dialogue, in particular, is focused and clear. This means that newscasters or the voiceover on a documentary have clarity, while the music in a show like The Great British Menu is nicely defined. Moving on to a programme with a more complex soundtrack like The Haunting of Hill House, the Polk is able to deliver the layered mix to the best of its ability. There's little in the way of surround, but music and dialogue are clear, effects are placed across the front and the added bass gives the scares more impact. There's no support for immersive audio formats, but then you wouldn't expect that for less than £250. However the Command Bar does support both Dolby Digital and DTS, allowing it to deliver surround soundtracks to the best of its ability. Watching X-Men on Blu-ray, the soundbar and sub combine to handle the dialogue, music and effects very well, but there's obviously no actual surround presence in the scene where Professor X's disembodied voice moves around the room. Ultimately, the Polk is able to create an effective sonic presence at the front of the room, but there's nothing to the sides or rear. There are four sound modes on the Command Bar: Night, Movie, Sport, and Music. The Night mode deliberately reduces the bass and dynamic range, and can be useful for watching your favourite shows when the rest of the family is tucked up in bed. The Sport mode isn't just for sport and enhances dialogue-heavy content. So sporting events, news broadcasts, talk shows, and documentaries can all benefit from the use of VoiceAdjust to boost dialogue clarity and optimise the subwoofer volume levels. The Movie mode is designed for films and TV dramas, boosting the bass to give blockbusters more impact. It also adds a greater degree of spacial awareness to soundtracks, giving them more scale without becoming echoey, while VoiceAdjust is employed to enhance dialogue. Movie mode is the default sound mode for HDMI and optical input sources. Overall, I found this mode could give movies greater presence, but I generally felt that the bass was a bit too heavy and the effects sometimes lost their definition. As a result, I usually found myself using Music for most content, with this sound mode delivering a more balanced soundstage and smoother bass. The spacial effects are minimised, which means that the sound has a more natural quality and better definition. When listening to the album Abattoir Blues by Nick Cave, I found that his vocals were delivered with a gravelly detail and the localisation of the instruments was pleasingly precise. The sub gave the drums a kick without overpowering the overall sound, and the Command Bar delivered a great two-channel performance. The inclusion of Amazon Alexa means that you can control the soundbar using your voice, although I found that you had to be fairly precise in terms of your instructions. However, as a smart assistant, the Polk was as effective as the Dot or Echo, listening to my questions and commands, and responding in a helpful manner. I could easily stream music from Spotify, which sounded very good, and the Command Bar interacted seamlessly with the Dot and Eco already located in my home. 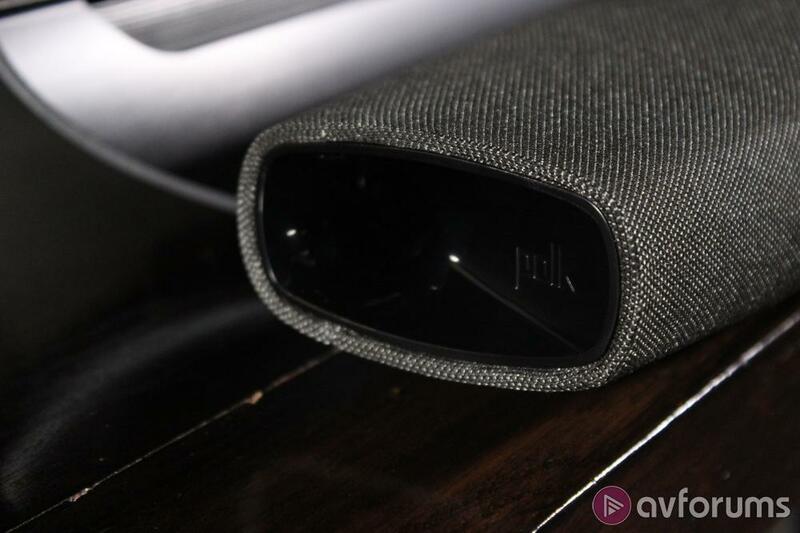 Overall, the Polk Command Bar is an impressive soundbar and subwoofer combination that delivers an excellent performance considering the cost and its 2.1-channel limitations. It also boasts features you would normally expect to find on a product twice the price, making it a real bargain. The Polk Command Bar is hard to fault, and while not perfect I doubt you'll find a better value soundbar anywhere. In fact, you have to wonder how Polk has managed to pack so much into a soundbar that costs less than £250. It uses a two-channel main unit that's is low enough not to block your screen, but still able to deliver a wide front soundstage. 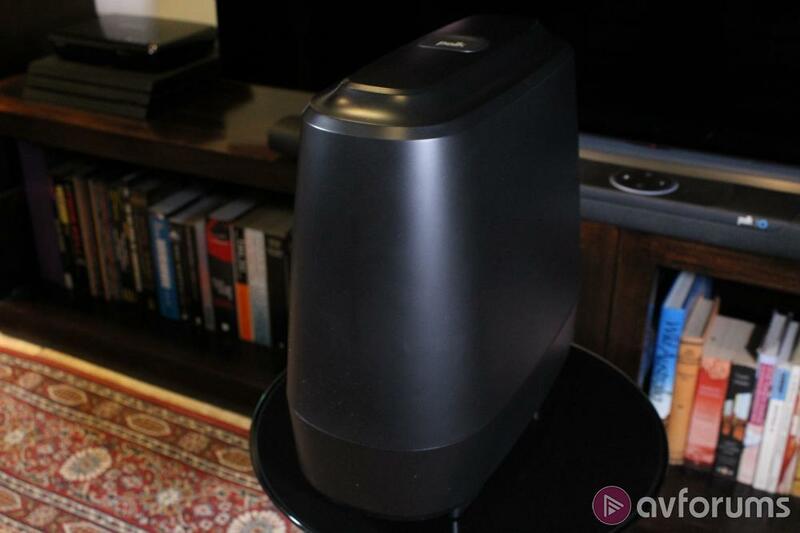 The subwoofer has some depth and integrates nicely with the soundbar, and the overall performance is excellent with TV shows, movies and music. There's no immersive audio support, but the Command Bar includes other features rarely seen at this price point. You get two HDMI inputs, a full size remote control, Polk's VoiceAdjust, four different sound modes, Wi-Fi and Bluetooth. 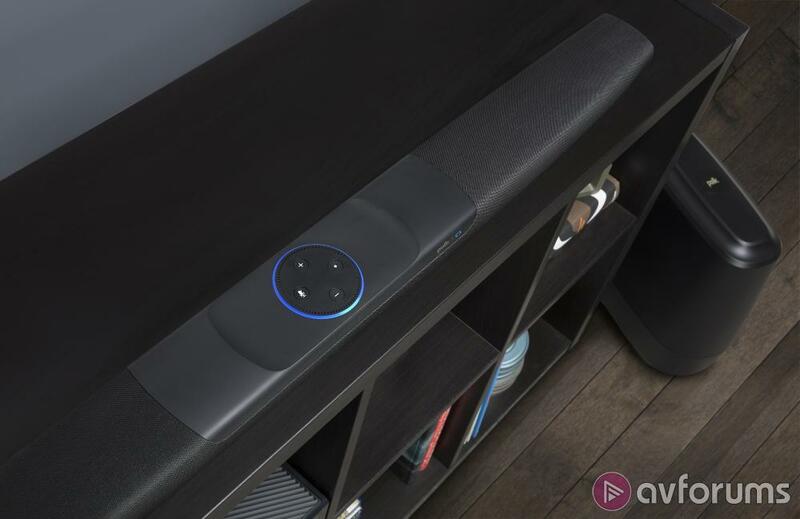 However, the headline feature is the inclusion of Amazon Alexa, which turns this soundbar into a fully-featured voice assistant. If you consider all of this can be picked up for just £227, then the Polk Command Bar is the very definition of a best buy. 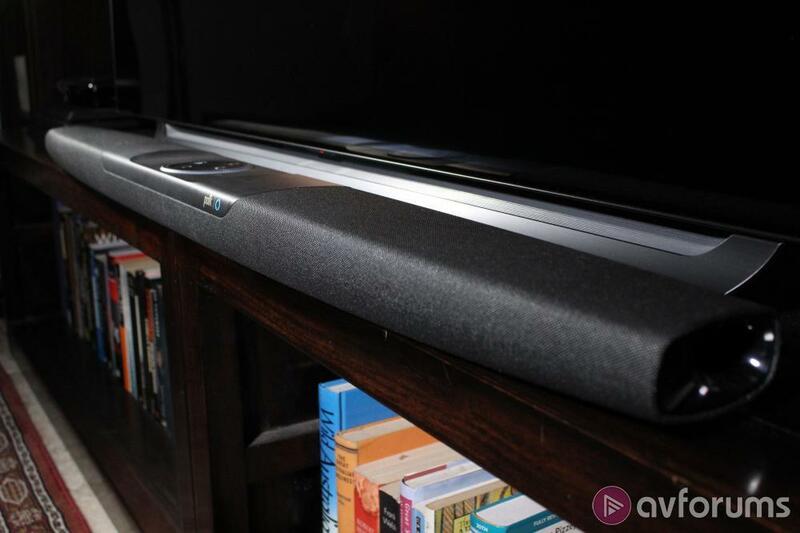 The Polk Command Bar is one of the most competitively priced soundbars that I've reviewed, which makes choosing alternatives tricky. In fact, there are only two that I can think of that even come close in terms of features and price. The Wharfedale Vista 200S is the most likely competitor and can be picked up for just £219. It doesn't sound as good as the Command Bar but does include a wireless subwoofer and an HDMI input. However, the remote is small and fiddly and there's no HDMI input, built-in Wi-Fi or a voice assistant. The other option is the Acoustic Energy AEGO Soundbar, which can also be picked up for £219. This well-made bar is fairly small but sounds much bigger than it looks. It's an excellent performer, especially with music and comes with a wired subwoofer. However, unlike the Command Bar, there's no HDMI connections, built-in Wi-Fi or voice assistant, and the remote is annoying diminutive. Write your Polk Command Bar Soundbar review.